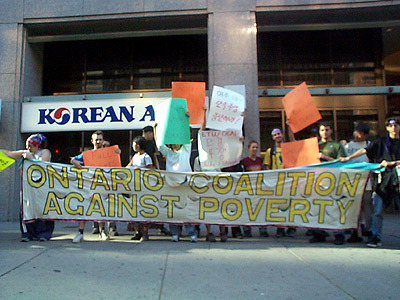 The Ontario Coalition Against Poverty (OCAP) held a solidarity picket outside the Korean Airlines office in downtown Toronto yesterday to protest the current crackdown on migrant workers in South Korea. Since September 1st, at least 50 workers per day have been arrested and detained. The Korean government is concentrating their arrests in the areas where the Joint Committee of Migrants in Korea (JCMK) and the Equality Trade Union-Migrant Branch (ETU-MB) are most active�Ansan, Masok, Bucheon, and Songnam. The ETU-MB has made allegations that the two migrant workers from Bangladesh, Kabir Uddin and Mohammed Bidduth (who was allegedly beaten severely during questioning), had their signatures forged by immigration officials so as to expedite deportation. Both of these workers have ongoing complaints lodged with the Korean Labour Office as well as the Korean Human Rights Commission (after the Ministry of Justice declared protest by undocumented workers illegal). While these complaints remain unresolved, the government has tried to deport them. They were en route to Incheon International airport when the forged documents were discovered; subsequently Kabir and Bidduth were returned to the Suwon detention center. Kabir and Bidduth were targeted because they helped organized an instrumental protest against the government�s EPS policy on April 7th. They organized 1500 undocumented workers to march in downtown Seoul to show that they were legitimate workers who deserve to have their rights recognized. They planned a subsequent protest for April 24th, but the government warned that it would deport any worker who attended, stationing immigration police at all subway stations in the vicinity. Subsequent protests in front of local immigration departments by migrant workers and their supporters have been harassed and attacked by the police. Base21.org reports that while Korea joined the International Labour Organization (ILO) in 1996, it has refused to ratify the ILO�s most important conventions that guarantee workers the inviolable right to organize and to take collective action. In addition, while Korea is a member of the United Nations, it engages in labour practices that directly contravene the UN�s Convention on Migrant Workers. According to the Equality Trade Union-Migrant�s Branch (ETU-MB), there are approximately 400,000 migrant workers in South Korea. 260, 000 of them are considered �illegal?by the South Korean government, either because they have escaped from the notorious �trainee?program that requires new arrivals to work for meager wages (averaging 400,000 W per month, or $500 Cdn), or because they were recruited illegally by Korean businesses. Migrants do most of the hard work for the small to middle heavy industries that are experiencing a labour shortage; they call their labour ?-D labour?because it is dirty, dangerous, and difficult. About twenty people attended the picket, including members of a Korean student group, OCAP, and a friend of Kabir and Bidduth, all of whom spoke to the rally. Rights to Work, Rights to Live: The Migrant Workers?Struggle in South Korea. According to the Equality Trade Union-Migrant�s Branch (ETU-MB), there are approximately 400,000 migrant workers in South Korea. 260, 000 of them are considered �illegal?by the South Korean government, most of whom came under the notorious �trainee?program that requires new arrivals to work for meager wages (averaging 400,000 W per month, or $500 Cdn). Migrants do most of the hard work for small to middle heavy industries; they call their labour ?-D labour?because it is dirty, dangerous, and difficult. Migrant workers in Korea often speak of their �Korean dream? to have legitimate, well-paid work in Korea that is free from oppression and discrimination. But they find themselves under constant stress from long working hours and dangerous conditions, as well as constant fear of deportation. The government �Trainee?system is the cause of much of this distress. Korea began importing Migrant labour en masse about eleven years ago. Many Korean workers were leaving the small to middle industries for the higher wages and benefits in the construction industry, creating a labour shortage. Foreign workers were then recruited internationally by the Korean Federation of Small Businesses (KFSB) to work in the �Trainee?system. By 1997, there were 300,000 migrant workers in Korea. But after the 1997 IMF crisis, migrant workers became scapegoats for the government�s neoliberal policies. As unemployment rose from two to five percent due to restructuring and privatization, the government initiated a crackdown, and by force or under threat of deportation, a full two thirds of the migrant workers (200,000) were repatriated. As the economy picked up again in 1999, migration to Korea increased once again under the �Trainee?system. Today there are 400,000 migrant workers in Korea, but nearly 70 percent are undocumented. Here�s why. First of all, �Trainee?is just an euphemism for �employee. ?The Korean government did not want to give migrant workers full labour rights or the right to free agency, and so they created the label �Trainee?to justify low wages and work restrictions in the name of education. Although it may sound like an apprenticeship program, the Trainee system, aside from a basic orientation, forces workers begin toiling full time in the factories from their first week in Korea. They spend two years in the trainee system before they can have their status upgraded to �labourer;?however, their employers have to recommend this change of status and it is rarely performed. Even where granted, this status does not grant the employee full labour rights, or significantly improve their pay. Under the Trainee system, workers cannot change their employers. This puts migrant workers at the mercy of their bosses. Bosses often withhold passports and wages as a �deposit?on the workers. In the case of accidents, health insurance rarely covers the workers and the boss takes treatment and sick day out of the workers?pay. Irregular pay periods are the norm; it is common to hear stories of bosses withholding workers?pay for periods up to a year and then not paying at all. Workers are often left with no choice but to �escape?the Trainee system; in many cases, it was a choice between life and death. Because of the high rate of �escapes?from the Trainee system, the Korean government began to fine employers for each Trainee who fled. One thinks this would be an incentive for the employer to treat their workers properly, but it has led to increased harassment and discrimination in the workplace. Even the KFSB has become critical of the governments?Trainee system, and most migrant workers are now recruited illegally, at home and abroad, by the small to medium industries. Undocumented migrant workers can get salaries of around 700,000 to 850,000 W (around $1000 Canadian), which occasionally includes housing. Comparatively, there are few incentives to stay in the exploitive Trainee system. In response to public pressure, the government has instituted a new policy towards migrant workers. They claimed they would grant amnesty for one year to undocumented workers who signed on to the Employee Permit System (EPS). Those who did not sign onto the EPS, and those who did sign but were found to have irregularities in their records, are to be deported immediately. Furthermore, the amnesty only lasts one year, after which the workers will face deportation. This will create a condition of mass flight come next May when the permits expire. The Equality Trade Union�Migrant�s Branch (ETU-MB) and the Joint Committee for Migrants in Korea (JCMK), have criticised the EPS as no more than thinly-veiled mechanism for the regulation and gradual deportation of migrant workers to make way for new imports into the �trainee?system. In fact, the Korean government appears be speeding up the deportation process. On August 29, 2002, the Office for Government Policy Coordination announced an early introduction of 20,000 new trainees. Immediately afterwards, forced deportations and the increased targeting of politicized migrants?groups began. Since September 1st, at least 50 workers per day have been arrested and detained. The Korean government is concentrating their arrests in the areas where the JCMK and the ETU-MB are most active�Ansan, Masok, Bucheon, and Songnam. The ETU-MB has made allegations that the two migrant workers from Bangladesh, Kabir Uddin and Mohammed Bidduth (who was allegedly beaten severely during questioning), had their signatures forged by immigration officials so as to expedite deportation. Both of these workers have ongoing complaints lodged with the Korean Labour Office as well as the Korean Human Rights Commission (after the Ministry of Justice declared protest by undocumented workers illegal). While these complaints remain unresolved, the government has tried to deport them. They were en route to Incheon International airport when their lawyer discovered the forged documents and was able to have them returned to the Suwon detention center. Kabir and Bidduth were targeted because they helped organized an instrumental protest against the government�s EPS policy on April 7th. They organized 1500 illegal workers to march in downtown Seoul to show that they were legitimate workers who deserve to be recognized. They had planned a subsequent protest for April 24th, but the government warned that it would deport any worker who attended, stationing immigration police at all subway stations in the vicinity. Subsequent protests in front of local immigration departments by migrant workers and their supporters have been harassed and attacked by the police. In the meantime, protests against the unfair arrests and deportations continue.